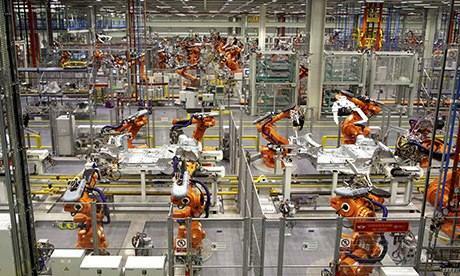 Robots stand ready to produce the new Mini Cooper at BMW’s plant at Cowley, Oxford, this week. Carmakers are held largely responsible for an increase in manufacturing output in the third quarter of 2013. Mike Hawes, the SMMT’s chief executive, said: “UK car manufacturing for the home market increased strongly in October. With European demand showing early signs of recovery, we expect production to continue positively in the coming months.” However, output from the manufacturing sector as a whole remains more than 8% below its peak before the financial crisis. Indications of the upbeat mood among manufacturers in the UK contrasts with more pessimistic surveys from the Eurozone, where this month’s first estimates of sentiment among purchasing managers – so-called “flash PMIs” – suggest that the economic recovery is petering out in several countries, including France.